DIED - On Tuesday last, at his residence in Sugar creek township, Edward Oswalt son of Michael Oswalt, Esq. aged 28 years. Death by Lightning - On the 22d ult. in Monroe Township, Preble county, Ohio, two daughters of Mr. Daniel Dashers, aged 10 and 13 years, when returning home from the orchard with a basket of apples, were instantly killed by a flash of lightning. A younger brother was with them, but escaped without material injury. On the same day, and within two hours of the above calamity, the house of Mr. George Walker of Twin Township, Starke county, Ohio, was struck by lightning, and one of his sons aged four years was instantly killed; the arm of a younger brother was broken and he was otherwise so seriously injured that little hopes were entertained of his recovery. Several other members of the family were more or less injured, but not dangerously. The Remains of Mrs. Moody Brought to Canton for Burial. 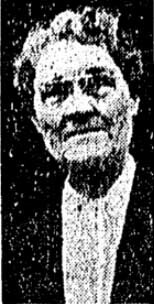 Mrs. Pauline Moody, aged thirty-two years, died of consumption at Mingo Junction Thursday. The remains will arrive in this city on the 5:30 train on the Ft. Wayne road. The funeral will be held Saturday at 2 o'clock, services at 144 East Tuscarawas street. Interment will be in Westlawn cemetery. The deceased was a sister of the Kanneberg brothers of this city. A husband and daughter and many friends mourn her death. Death of Mrs. Thomas R. Morgan. ALLIANCE, Sept. 21. - Mrs. Elizabeth Morgan, wife of the late Hon. Thomas R. Morgan, sr., died at her residence on South Liberty avenue this evening after an Illness of several months. She was sixty-two years of age. Had Been Resident of City During Entire Life. Mrs. Emma J. Lehman, 56, wife of John H. Lehman, died at her home, 1506 North Cleveland avenue, early Tuesday morning after an illness extending through a period of nearly two years. Death was caused by arterio sclerosis. Mrs. Lehman was born near Canton and was the daughter of Mr. and Mrs. Adam Oberlin. She had resided all her life in and near Canton. She is survived by her husband, John H. Lehman insurance agent and president of the board of education, one daughter, Miss Eva E. Lehman, supervisor of music in the public schools, and one son, Fred H. Lehman of Canton. Two sisters, Mrs. Katherine Lehman, of Bellevue, O., and Mrs. John Luiz, of Canton, also survive. The funeral will be held Thursday afternoon at 2 o'clock at the home. Dr. J. A. Hall, of Mansfield, former pastor of Trinity Lutheran church here, will conduct the services. The pallbearers will be B. T. Steiner, L. H. Koch, Charles Kilgore, J. K. Baxter, Elmer Mack and W. B. Shanafelt. Burial will be in Westlawn cemetery. Word has been received here of the death at her home in Cleveland of Mrs. Kate Bockius, 70, wife of A. R. Bockius. Both Mrs. Bockius and her husband were former residents of Canton. Mrs. P. H. Barr and Mrs. A. J. Underhill, of Canton, are sisters. Mrs. F. E. Dussel, of 'Alliance, is a daughter. Funeral services will be held here Friday morning at the home of Mrs. P. H. Barr. Complete arrangements have not been made. Two Deaths in Cymric Circles - Premier Welsh Tenor Coming. Alliance, Ohio, Jan. 7. - After a protracted illness of many weeks, Mrs. Mary Thomas of College street died at her home on Tuesday, Dec. 14, 1915. She was born in Palmyra, Ohio, sixty-eight years ago, and was the daughter of Mr. and Mrs. J. W. Davies. In 1870 she was united in marriage to W. W. Thomas, of Alliance. They resided in Palmyra for many years, but several years ago came back to Alliance, where they resided permanently. Besides her husband, she is survived by the following children: Ivor Thomas, of Cleveland, Ohio; Gomer Thomas, of Rice street, Alliance, and Luella and Elizabeth Thomas who reside with their father at home here. Since childhood Mrs. Thomas was a consistent and a faithful worker in the Lord's vineyard. One of hte old Welsh hymns she learned when a child was about the last words she spoke before her soul took its flight into the presence of Him who rewardeth the faithful. Although born in this country. Mrs. Thoams could talk the Welsh language as though she had just come from Tregaron. We extend to the family our sympathy, and pray that the exemplary life of this good mother in Israel will be the means of awakening our Welsh friends, and others that knew her, to a more earnest endeavor to follow her, as she followed the Master. The funeral took place from her late home on the following Thursday, the Rev. O. R. Williams, of the Welsh Presbyterian church, officiating, assisted by the Rev. F. J. Brysom, of the First Presbyterian church, and the Rev. Mr. Humphries, of Lowellville, Ohio, an old friend of the family. Interment took place in the Alliance cemetery. We have also to record the death of an old Welsh character by the name of Daniel Jones, which occurred a few days ago. He was known only to a few people. He came here a few years ago from Sharon, Pa. Soon after coming here he was taken sick and was partly paralyzed; hence he did not get out much. He was born in Merthyr Tydfil eighty years ago, and was a puddler by occupation. He lived he most of his time since coming to this country in Sharon. The body was taken to Sharon for burial. The Rev. Mr. Williams, of our Welsh church, having charge of the services, both here and at Sharon. We are sorry to record that our friends, Mr. and Mrs. Evan Jones, and their brother, John Jones, of South Street, received the sad news from Wales of the death of their brother, Henry Jones, Mochras View, Lanbedr, Meirionethshire. Mr. Jones was a gardener, and leaves a widow and six children. May all these people dwell in the shadow of the Almighty. On Monday evening, January 17, the world-renowed Welsh tenor, Evan Williams, will be in our city. He has many admirers in our city, and it is believed a capacity house will greet him. In the third week of this month the Rev. R. J. Williams, of Venedocia, is here and in Palmyra for a series of meetings. On Sunday, January 16, he will be in Palmyra, remaining there until Thursday, when he comes to Alliance, tarrying here until after Sunday, January 22. Mr. Williams will preach in the English language, except on Saturday night and Sunday morning. May the Lord come with His servant, is our prayer. It is a pleasure to record that three men of Welsh blood were elected last November for city offices. We refer to A. W. Morris who was re-elected city solicitor; Harry Roderick, city treasurer, and R. E. Jones, justice of the peace. Mr. Morris was born in Marlboro, this county, and Mr. Roderick in Kentucky, while Mr. Jones is a native of Tredegar. W. J. M.
Word was received today by relatives here of the suicide yesterday of Edward Oswalt, about 32 years of age,, who resided on a farm a mile west of Hastings, 22 miles south of Elkhart. Despondency is ascribed as the motive for the deed. No particulars were stated except that death was caused by shooting. Oswalt was in service for two years during the World War, serving a part of the time in France, where he took part in some of the big battles. Upon his return four years ago, he was married, the young couple taking up their residence in Leesburg, where Mr. Oswalt owned a meat market. About two years ago he sold the business and moved to the farm. Surviving Oswalt are his wife; three daughters, the oldest of whom is about three years of age; his mother, Mrs. Sarah Oswalt, and three sisters, all of Constantine; four brothers, Jesse Oswalt of Elkhart and John, Claude and Percy Oswalt, all of Constantine; five cousins, Mrs. Verne Shriver, Mrs. A. E. Doering, Mrs. Alex Hoover, Serman Swan and Owen Oswalt, all of Elkhart, and three uncles, Frank, Edward and Charles Fields, all of Elkhart. His father, Michael Oswalt, died a year ago in Leesburg. The funeral will be held tomorrow with service and burial at Stony Point church. JOHN H. LEHMAN, 78, for many years a prominent leader in Canton public schools and one of the City's oldest insurance men, died in his home, 1506 Cleveland ave NW, Saturday night from a complication of diseases. Mr. Lehman had been in poor health for the last year, but had been confined to his bed only since last Sunday. He was born in Lancaster, Pa., May 17, 1846, and moved to Stark county with his parents when only a boy. At the age of 16 he came to Canton, where he had since resided. When only a young man he entered the educational field and was appointed principal of the old North Cherry school. After a short term in this office he was elevated to the position of superintendent of the city schools. After more than 12 years of service at the head of the schools he tendered his resignation in 1888 to enter the insurance business. After years of successful endeavor in the insurance field, still being greatly interested in the development of the city schools he entered the race for member of the board of education and was elected. He served as a member of president of the board for more than 12 years. While a member of the school body he was one of the principal leaders for better schools for the city, and it was during his tenure in office that the present site of the McKinley high school was purchased. The first contracts for the new building also were let before he retired from the work. The extensive building program which was recently completed by the board was outlined during his administration. Following his retirement the board of education named the new junior high school at 14th st and Oxford ave in his honor. Mr. Leman was always greatly interested in agriculture and served for 12 years as secretary of the Stark County Agricultural Society, filling this position at the time when the organization moved to the present fair grounds. Besides his interest in educational and agricultural developments Mr. Lehman was prominent in many of the larger civic movements, having been a leader in the campaign for the erection of the present city auditorium and active in many other civic projects. Mr. Lehman was prominent in church work, having been a member of the Trinity Lutheran church for the past 50 years, serving as elder for many years. He is survived by his wife, Mrs. Sarah A. Lehman and two children, Eva E. Lehman and Fred H. Lehman. Funeral arrangements have not been completed. SCHWARTZ, Adam William, 74, a life resident of Stark county, died early today in Mercy hospital following an operation. He was born in Mapleton and lived in that vicinity and in Canton all his life. He was a member of First Reformed church. Surviving are, a daughter, Mrs. Alma O. Mong of East Canton-Waynesburg road, and a son, Charles G. Schwartz of Canton. His wife, Mrs. Emma L. Schwartz, died more than three years ago. Funeral services will be held Monday at 1 p.m. at the home on East Canton-Waynesburg road and 2 p. m. at First Reformed church, Canton. The body will be removed from the Weirich funeral parlors at East Canton to the home, Sunday noon. HUBER, Mrs. Mary, 62, died in her home at 1415 Llutz place NE, after an illness of 10 days from a stroke of paralysis. She is survived by her husband, Frank Huber; a son Alexander H. STanecki of Youngstown; four grandchildren and two great-grandchildren. The body is the E. Jay Welch parlots. DOWNING, Dennis, 66, of 2306 14th street NE, died Friday night in his home after a long illness. He had lived in Canton for 15 years. He is survived by his widow, Mrs. Nettie Downing; five stepchildren, Mrs. Flossie Truby of Kittanning, Pa., Mrs. R. Haidet of the home, MRs. Peter Herr of Canton, J. J. Bollman of Los Angeles, Calif, and J. D. Bollman of Canton; 13 grandchildren, his mother, three sisters and a brother living in Ireland; two brothers in NEw York City, and a sister, in Massachusetts. Mr. Downing was a member of St. John's Catholic church. The body is at the Jacobs parlors. GARCIA, John, 42, of 1819 Hammond avenue SW, died Friday night in his home from a complication of diseases. He leaves his widow, Mrs. Helen Garcia; a sister, Mrs. Mary Gravil of Canton; two brothers and two sisters, living in Europe. The body is at the Whitticar parlors. HAMMOND, Robert, 2, son of Mrs. Lane Hammond, of 1115 Liberty avenue SE, died Friday afternoon in Mercy hospital after an illness of one week. Beside the mother he leaves a brother, James Hammond. Services will be held Tuesday at 2 p. m. at the Matthews parlors. Burial will be in Forest Hill cemetery. SHIVELY, H. A. (Pete) - Services will be held Monday at 2 p. m. at the Seesholtz funeral home, in charge of Rev. W. E. Bridge. Burial will be in Westlawn cemetery. The Eagles will hold a memorial service Sunday at 8 p. m.
Mr. Shively died Friday in Aultman hospital from pneumonia. PENN, William - Funeral services will be held Monday at 1 p. m. at the Baker Parlors. Burial will be in Forest Hill Cemetery. WOLFE, Mrs. Charlotte - Funeral services will be held tonight at 7:30 at the home of her daughter, Mrs. R. M. Moore in 32nd street NW. Rev. W. E. Bridge will be in charge. The body will be taken to Ironton after the services. Additional services will be held there Monday morning. WITMER, Franklin P. - Services will be conducted Sunday at 2 p.m. at the home in East Sparta in charge of Rev. G. H. Klotz. Burial will be in the East Sparta cemetery. Mr. Witmer died Friday after a long illness. MASSILLON - Conners, Thomas Joseph, 50, employed as a carpenter for the last nine years at Massillon State hospital, died Friday. He was a member of the Carpenters' Local, No. 881, and of the Fraternal Order of Eagles. He leaves his widow, Mrs. Effie Laher Conners; a stepdaughter, Rose Mary Laher of Massillon; and a stepson, Charles J. Laher, stationed at Fort Warren, Cheyenne, Wyo., with the First infantry. Funeral services will be held Monday at 9 a. m. at Heitger's funeral home here and burial will be in the cemetery of St. Joseph's Catholic church. MASSILLON - Doll, George W., 71, died Friday shortly before noon at his home, 802 Wellman avenue SE. He was a member of the Jr. O. U. A. M., the Knights of Pythias and the Protected Home circle. Surviving are his widow, Mrs. Minnie C. Doll; a daughter, Mrs. Grace Blacet; and a son, Howard G. Doll, all of Massillon; one brother, John Doll of Spencerville, Ind; and a sister, Mrs. Charles Hammer of Canton. Funeral services will be held Monday at 2:30 p. m. at the home in charge of Rev. Isaac B. Harper of the First Methodist Episcopal church and burial will be in Massillon cemetery. ALLIANCE - Pearsol, Mrs. Mary E., 73, of 213 East Milner street, died at her home late Friday afternoon after an illness of two months. She was born at Mount Union and was the daughter of Rev. George W. Golmore, pioneer Mount Union resident. She was a member of the First Methodist Episcopal church, the W. C. T. U. and Roundtable club. She was active in Women's church affairs. Surviving are her husband, Charles F. Pearsol, two sons, John G. of El Paso, Tex., and Howard, at home, and five grandchildren. Funeral services will be held at the Cassaday & Turkle funeral home Monday at 2:30 p. m. with Rev. E. R. Romig in charge. Burial in Mount Union cemetery. Friends may call at the funeral home Sunday from 7 to 9 p. m.
MALVERN - Buck, Mrs. Laura, 58 died late Friday night at her home in Malvern after a long illness. She graduated from Malvern High school in 1892 and taught school in Dellroy for three years. Surviving are a son, Charles W. Buck of Malvern; a brother, Charles W. Reed of Denver, Colo.; three sisters, Mrs. J. E. Wagner of Paris, Mrs. W. Dieringer of Malvern and Miss Marjorie Reed of Malvern. Funeral services will beheld Monday at 1:30 P. m. at the and 2 p. m. at the Lutheran church with Rev. P. P. Wilt in charge. Burial will be made in Bethlehem cemetery. NEW PHILADELPHIA - Hykes, Roletta M., 79, widow of the late John D. Hykes, lifelong resident of this city, died Friday at the home of her son, Charles Hykes of Navarre while visiting there. Diabetes caused death after a week's serious illness. Surviving are three sons, Charles at whose home she died; L. Franklin Hykes of Pittsburgh; five daughters, Mrs. Ida Swinehart of this city, Mrs. Paul Van Fossen and Mrs. E. J. Borphy of Cincinnati, Mrs. R. P. Dalrymple of Bryan, O., and Mrs. Rinda Neal of Ft. Myers, Fla.; and one brother, Orlando Buckius of Detroit, Mich. Private funeral services were held at the Linn-Hert funeral home here Saturday at 10 a. m. with Rev. R. B. Van Fossen officiating. Burial in East Avenue Cemetery. GEORGE S. BRIGGLE, 87 died early this morning in his home, 179 Wertz ave NW, after a brief illness. A native of Plain twp. Mr. Briggle had resided in Canton for more than 35 years. He was building contractor and was an employe of the Northern Ohio Traction & Light Co., until his retirement. Mr. Briggle was a member of the First United Brethren Church and a charter member of the Ben Hur Life association. Surviving are two daughters, Mrs. Bertha Clarke of Detroit and Miss Flora Briggle of the home, three grandsons and one great-granddaughter. His wife, Mrs. Emma Briggle, died six years ago. The body is at the Orville Smith parlors and will be taken to the home Wednesday afternoon at 2. JESSE BARROW, 61, died this morning in his home, 816 3rd st. SW, from a complication of diseases. He leaves his sister, Mrs. Ida Hamilton; three nieces, Mrs. Daisy George, Mrs. Maud Pruitt and Mrs. Ella Louise Welch, all of the home, and a nephew, Frank Johnson of Youngstown. The body has been taken to the Webster parlors. RALPH FERRY, 86, died Monday night at his home, 1611 2nd st NE, from infirmities of age. He was a native of Italy, and a member of St. Anthony's Catholic church. Surviving are four sons, Henry of Akron, Victor, John and Patsy; two daughters, Mrs. Mary Scarpucci and Mrs. Justine Rohrbaugh; a brother, Morris Ferry; 22 grandchildren and four great-grandchildren, all of Canton. EDWARD M. HILL, 80, of 707 10th of NW, a retired cigar maker, died Monday night in his home. Mr. Hill resided in Massillon for many years, coming to Canton 10 years ago. He was a veteran of the Spanish American war and a member of the Knights of Pythias lodge of Cleveland. Surviving are his widow, Mrs. Alberta Hill, and a sister, Mrs. Josephine Washburn of Washington, D. C. The body has been taken to the C. D. Spiker parlors. MRS. HATTIE V. CALDWELL, 71, died today at noon at the home of her daughter, Mrs. Mary E. Bernhardt, of 1616 Cleveland ave NW after a long illness. She was a native of Jacksonville, O., and had been a resident of Byesville. Surviving besides Mrs. Bernhardt are five other daughters, Mrs. Nellie Wilson, Mrs. Susie Moryer and Mrs. Ida Watson, all of south west of Canton, and Mrs. Margaret Knott and Mrs. Florence Davis of Byesville; three sons, John and Clarence Caldwell of Canton and William Caldwell of Cleveland; one brother, Benjamin Valentine of Cambridge; two sisters, Mrs. Mary Gill of Bethesda and Mrs. Emma Keith of Zanesville, and 17 grandchildren and two great-grandchildren. The body will be taken to the Herman funeral home at Byesville where services will be held Thursday at 1:30 p.m.
MRS. M. G. KAIL. Rev. L. R. Akers will have charge of funeral services Wednesday at 2 p.m. at the Seesholtz Memorial for Mrs. Rebecca Kail, wife of M. G. Kail. Burial will be in Warstler cemetery. Friends may call at the Memorial until the hour of the service. Mrs. Kail died Sunday night in her home, 511 Dryden ave NW. MRS. BONZOLA DAWSON. Funeral service for Mrs. Bonzola Dawson will be Wednesday at 2 p.m. in Antioch Baptist church with Rev. R. T. Harris in charge of the service. Burial will be in Forest Hill cemetery. The body will remain at the Matthews parlors until the hour of the service. Mrs. Dawson, who resided at 728 Cherry ave SE, died Saturday in Massillon State hospital after a brief illness. KARL M. STEITZ. Waynesville - Karl M. Steitz, 32, an employe of the Republic Steel Corp. plant at Canton, died unexpectedly Monday at his home here. Service will be at 2 p. m. Thursday in the M. E. church, and interment will be in Sandy Valley cemetery. Rev. T. A. Keiser will officiate, assisted by Rev. 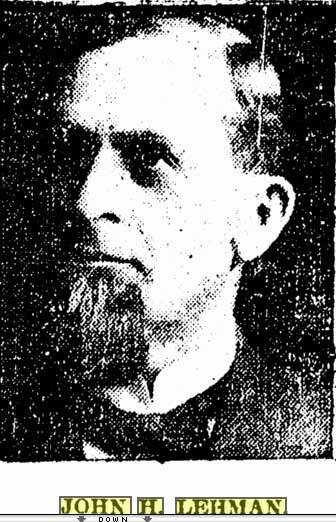 Ernest Howell of Canton and Rev. D. A. Springer of Dennison. The body will be taken to the home Wednesday from the Finefrock funeral parlors. Surviving are his widow, Virginia Hostetler Steitz; his father Louis Steitz of Waynesburg; a sister, Mrs. Thomas Colley of Waynesburg, and three half-sisters, Mrs. Henry Brown of Waynesburg, Mrs. Harry Kimbel and Miss Jessie Miller of Canton. Local Doctors Will Attend Rites for City's Oldest Practicing Physician. Members of the Canton Medical - Library society, composed of Canton physicians, will meet Wednesday at 2:45 p.m. at I. O. O. F. temple to walk to the home of the late Dr. E. J. March at 717 14th st NW where funeral rites will be held at 3. Rev. E. C. Herman of Trinity Lutheran church and Rev. P. H. Welshimer of First Christian church will conduct the rites and burial will be in Westlawn cemetery. Pallbearers will include Dr. Joseph E. McNalley, Dr. J. R. Brandon, Dr. Floyd C. Hendrickson, Paul Hartung, Roger Kelley and Thomas Saxton. Dr. March, 80, was the oldest practicing physician in Canton and had been engaged in the practice of medicine for 54 years, of which 52 was spent in Canton. His death Sunday night followed an illness of two weeks resulting from coronary thrombosis. He had been a member of the medical staff at Aultman hospital since 1891 and at the time of his death was head consulting surgeon. "It was with the deepest regret that the medical profession in Canton learned of the death of Dr. E. J. March. "His intellectual capacity, his honesty with his patients, and his devotion to duty were major influences on the medical profession in Canton for half a century. As a citizen his influence spread beyond his profession due to his friendliness and his genuine interest in the welfare of the community. The medical profession has lost a leader and the people have lost a friend. "The Canton Medical-Library society extends its deepest sympathy to his family. MRS. W. W. YOUNG DIES IN HUNTINGTON, IND. Word has been received here of the death Saturday at Huntington, Ind., of Mrs. Anna Welch Young, wife of Weston W. Young, formerly of East Sparta. Funeral services were held today at Huntington. Mrs. Welch is survived by two daughters, Mrs. Emma Harmey of Indianapolis and Miss Pearl Young of Huntington; one sister, Mrs. Maude Watson of Waterman, Calif.; two brothers, John Welch of Huntington and Elmer E. Welch of East Sparta; also one grandchild. FUNERAL SERVICES FOR LEHMAN TODAY. Funeral services for Fred. H. Lehman were to be held at 2 p.m. today at the home, 1000 23rd st NW, in charge of Rev. E. C. Herman and Rev. W. H. Lehman Burial was to be in Westlawn cemetery. Mr. Lehman, 58, employed at the Timken Roller Bearing Co., died Sunday in Mercy hospital. Death resulted from a heart malady. Mr. Lehman was the son of the late John H. Lehman, former superintendent of Canton schools. Mrs. Ellen Clapham sister of Mrs. Emily B. Martin, formerly of Canton, died Sunday in St. Elizabeth's hospital, Danville, Ill., following a long illness. Mrs. Clapham had a wide circle of friends in Canton. Mrs. George C. Reiter of 2226 Harvard ave NW, Mrs. Brooke Martin of 1221 Cleveland ave NW and Mrs. Ann MacKenzie of 1308 Cleveland ave NW left Monday night to attend the funeral services which will be held Wednesday afternoon at Attica, Ind. Furnace services for Frank Gamble, 75, 2834 Birmingham, who died Sunday in North Canton, Ohio, were held in Alliance, Ohio, Wednesday. Burial was in the Alliance City Cemetery. Mr. Gamble had been ill for the last six months. He had arrived in North Canton last Friday and was at the home of Mr. and Mrs. Orin Brick there when he died. Born in Beaver County, Pennsylvania, in 1865, Mr. Gambel lived in Alliance from 1899 to 1927, coming to Dallas thirteen years ago. He was a carpenter and for the last ten years had been retired. He belonged to the Scofield Memorial Church here. Surviving are his wife, Mrs. Ella Gamble; two daughters, Mrs. Floyd Brick, of Dallas and Mrs. Earl Barr of Akron, Ohio; a son, Nesley Gamble of Alliance; a sister, Mrs. Minnie Harper of Coraopolis, Pa.; a brother, Elmer Gamble of Wellsville, Ohio, and eight grandchildren and one great-grandchild. Mrs. Charlotte Ann Ream, formerly of North Canton, died this morning in her home on Freshley road, RD 1, Alliance, following a heart seizure. She was 51. Mrs. Ream leaves her husband Adney Ream; one daughter, Mary Catherine, and one son, Joseph A. Ream of the home; two brothers, Cyril Pierson of Pomeroy and Peter Pierson of Clinton, and two sisters, Mrs. Agnes Schislerof Carrollton and Mrs. Agnes Schisler of Carrollton and Mrs. Elsie Ward of Canton. Funeral services will be Monday at 9:30 a. m. in St. Pal's Catholic Church in North Canton with Rev. Fr. Raymond Steiger singing the requiem High Mass. Burial will be in the church cemetery. The body is at the Lewis funeral home where friends may call Saturday from 7 to 9 and Sunday after 2:30 p.m.
Mrs. Sarah J. Pfouts of 601 Newton ave NW, widow of LeRoy S. Pfouts, died Thursday night in the Fairview Convalescent Home after an illness of several months. A life resident of Canton, Mrs. Pfouts, who was 74, had resided at the home address 53 years. A daughter of the late Emanuel and Christiana Killian, she was a member of Trinity Lutheran Church. Mrs. Pfouts leaves two sons Paul L. Pfouts of Cuyahoga Falls and A. L. Pfouts of Canton; two sisters, Mrs. E. A. Vivian of Duluth, Minn., and Mrs. James Roof of Canton. Funeral services will be Monday at 3 p.m. in the Schneeburger funeral home, conducted by Rev. Willard I. Hackenberg. Burial will be in Northlawn Cemetery. Friends may call Sunday from 2 to 4 and 7 to 9 p.m.
Eli Zalick, a native of Yugoslavia, died this morning in the Stark County Home. He was 56 and had been a Canton resident 25 years. The body is at the Rossi funeral home. Eight Canton nurses will serve as honorary pallbearers at funeral services for Miss Margaret Nohilly Saturday at 9 a. m. in St. Peter's Catholic Church. They include Mrs. Stella Sizek, Miss Anna Keffler, Miss Abbie Sullivan, Miss Irene Westerh, Miss Christiana Frank, Mrs. Clyde Stutzman, Mrs. Frances Paumier and Mrs. Esther Plero. The active bearers will be John Guilliam, Glen Ferrell, Herman Bambeck, Robert Schissler, Charles Snyder and Edward Schrum. Miss Nohilly, who died Wednesday morning in Mercy Hospital, was a member of the 1914 class of Mercy Hospital Nursing School. Rt. Rev. Msgr. George N. Habig will sing the requiem High Mass and burial will be in Calvary Cemetery. Friends may call at the Welch funeral home today from 2 to 4 and 7 to 9 p.m.
Harry R. Ickes, vice president of the Climalene Co. and one of its earliest salesmen, died this morning in Aultman Hospital where he had been a patient since Aug. 22. He was 67. In 1911 Mr. Ickes joined the sales staff of the Climalene Co. and was associated at that time with the late Calvin E. Ball, one of the company organizers. Within a very short time Mr. Ickes developed into an outstanding salesman and was responsible for the sale of the first carload of the product during the Cleveland area he was sent to Indianapolis. Mr. Ickes, an advocate of sample distribution, often went to the Indianapolis interurban terminal where he personally handed out samples to persons boarding street cars and buses. Mr. Ickes went from Indianapolis to Chicago where he was in charge of the office and in 1930 was called to Canton and elected a vice president in charge of sales. He held these offices until his retirement. As a result of his sales ability the grocery industry named him a member of the merchandising committee of the Grocers Manufacturers Association. During his Canton residence Mr. Ickes was an active member of Trinity Lutheran Church, having served several years as a trustee. He was a native of Sandyville, Pa.
Mr. Ickes leaves his widow, Mrs. Nellie Ickes of the residence at 121 Bellflower ave. NW; one daughter, Mrs. John Howenstine, and one son, Dr. Howard Ickes, both of Canton, and three grandchildren. Funeral services will be conducted by Rev. Willard I. Hackenberg Monday at 1:30 p.m. in the Spiker funeral home. Burial will be in Forest Hill Cemetery. Friends may call after 2 p.m. Sunday. John Gibson of 1470 Hoskins pl SE died Thrusday afternoon in Molly Stark Sanatorium. He leaves his stepfather and mother, Mr. and Mrs. Twine Randell of the home. The body is at the Matthews funeral home. Funeral services for Mrs. .Carrie L. Kienzle, long time secretary at First Christian Church, will be Saturday at 2 p.m. in the church. Rev. P. H. Welshimer, for whom Mrs. Keinzle has been secretary for more than 40 years, will conduct the services. Six members of the official board of the church who will serve as pallbearers are Milo Dunbar, Fred Hayden, C. J. Hunt, S. F. Bowman, A. R. Arnold and Kramer Early. Burial will be in Westlawn Cemetery. Mrs. Kienzle, who was 62, died Thursday morning in the home at 1209 15th st. NW, following an illness of several months. In addiiton to her husband, w. F. Kienzle of the home, she leaves one sister, Mrs. Ralph Roudebush of Canton; one stepdaughter, Mrs. Donald Comin of Wooster, and two grandchildren. The body is at the Whittiear funeral home and will be taken to the church an hour before the service. MASSILLON - Miss Anna J. Heinzer, t9, of 2778 Lincoln way W, died Thursday in her home. She leaves one brother, Joseph Helnzer of Massillon. The body is at the Heltger funeral home. Funeral arrangements are incomplete. MASSILLON - Pedro DeHaro, 65, a chipper at the Massilon Steel Castings Co., died Thruday in Massillon City Hospital. Mr. DeHaro resided at 679 Griffith ave SW. He leaves his widow and three daughters in Spain, and a nephew, Diego Snez of Massillon. Burial will be held Saturday at 11 a.m. in Massillon City Cemetery. Friends may call at the Gordon-Shaidnagle-Hollinger funeral home tonight form 7 to 8. MASSILLON - Services and burial for Mrs. Lelia Hartman, 41, former Massillon resident, were held Thursday afternoon at Rocklin, Calif.
Mrs. Hartman died Tuesday in her home at Rocklin after an Illness of one year. She resided in Massillon many years before moving to California 11 years ago. She leaves her husband, Jake Hartman; two sons, Clyde of Roseville, Calif., and Jack of the home; two daughters, Peggy of San Francisco and Jeanne of the home; her mother, Mrs. Charles Carson of Hopedale; her father, L. C. Dunn of Navarre; two brothers, Harry Dunn of Canal Fulton and James Dunn of Port Huron, Mich.; a sister, Mrs. Mary Rose of Massillon; her stepfather, Charles Carson of Hopedale; three stepbrothers, Clarence and Lawrence Carson, both of Jewett and John Carson of Hopedale, and a stepsister, Mrs. Isabelle Thompson of Washington, D. C.
Mrs. Mark A. Rodgers - Saturday 2 p.m. Arnold parlors. Rev. Herman S. Sidener officiating. Mrs. Henry Stiffler - Saturday 1 p.m., Schneeberger parlors. Burial Forest Hill Cemetery. Homer Barnes - Saturday 2:30 p.m. Macedonia Baptist Church, Waynesburg. Burial Sandy Valley Cemetery. Body to be taken to the home in Waynesburg today from the Webster parlors. John W. Randolph - Saturday 3:30 p.m. Cassaday & Turklefuneral home, Alliance. Burial Mt. Union Cemetery. Friends call funeral home. Louis B. Mapel - Saturday 2 p.m. residence Salineville. Burial Woodlawn Cemetery. Friends call residence. Mrs. Frank Haynam - Saturday 2 p.m. Rutledge - Jackson funeral home, Minerva. Burial Eastlawn Cemetery. Friends call funeral home Friday. Mrs. Zold Morgan - Saturday 1:30 p.m. Morgan funeral home, Shreve. Burial Fairview Cemetery. Friends call funeral home. Frank Burchfiel- Saturday 1:30 p.m. Ulrich & Son funeral home, Uhrichsville. Mis. Elsie Puckett - Saturday afternoon at Buford. Burial Buford. Mrs. Anna Barrett - Saturday 2 p.m. Gintz funeral home, New Philadelphia. Burial East Fair at Cemetery. Friends call funeral home. Rev. Fr. O'Donnell Headed University Six Years. Rev. Fr. J. Hugh O'Donnell, C. S. C., who served as president of the University of Notre Dame for six years, died yesterday at the age of 52. Father O'Donnell, who has been ill with cancer and several months ago had undergone an operation, retired as president a year ago and was succeeded by Rev. Fr. John J. Cavanaugh. He became president in 1940. He was born June 2, 1895, in Grand Rapids, Mich., and entered Notre Dame in 1912. He was an honor student and center on the football team in 1915. 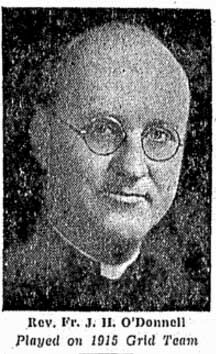 He was ordained to the priesthood at Grand Rapids Dec. 28, 1921, and was named rector at Badin Hall at Notre Dame in 1923. Funeral services will be held at Bridgeport, O., Saturday at 2 p.m. for Howard H. Groves, 52, brother of Arthur J. Groves of 500 17th st. NW and brother-in-law of Mrs. J. A. Maxwell of 2521 11th st NW, A. J. Groves is associated with the Canton office of the Ohio Power Co.
Mr. Groves died in Martins Ferry hospital Wednesday afternoon after a brief illness. He is survived, in addition to his brother, by his widow, Mrs. Ruth Groves, and his parents, Mr. and Mrs. George Groves of Bridgeport. HARTVILLE - Services for Clement Harple, 82, of Hartville, will be Saturday at 2 p.m. in the Emanuel Lutheran Church, of which he was a member. Rev. H. C. Rochner will be in charge. Burial will be in Mt. Peace Cemetery. Friends may call at the residence. Mr. Harple died Wednesday in Altman Hospital, Canton, after a long illness. He leaves his widow, Mrs. Darcyetta Harlpe; a son, Arthur Harple of Canton; a daughter, Mrs. Frank Tessmer of Hartville; a niece, Mrs. Clarence Albrecht of Canton, whom he raised; nine grandchildren, and six great-grandchildren.